Now that I have the Picnic Day participation well in hand (if anyone out there still wants to participate in the big parade in Davis on April 22 and hasn’t contacted me, do so now!) I wanted to start getting interest in this great annual British car show up. The USBCC show is one of the best I’ve ever been to. The caliber of the cars is second to none, the venue is lovely this time of year, and both the participants and attendees tend to be very respectful, classy and fun. If you’re interested in more details, the site is http://www.ubscc.org/CarShow.htm - pre-registration is open now and the event is on Sunday, May 21 from about 7am-1pm. 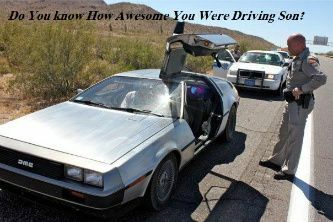 If we have at least 3 DeLoreans we will get our own judging class, which means we are guaranteed some trophy cars. I’ve won an award every year except last year, which was a huge upset - I hope to reclaim my title with my fancy new PJ Grady re-grain! Hope to see some of you there. At least 2 besides me, since I really don’t want to end up in the dreaded “British Specialty” class with all the other oddballs. Just bumping this thread up again, in case anyone hasn't seen it yet. Between me and Ken M we have two cars in the DeLorean judging class, and will be represented in the winner's circle by Stephen Ivie. We just need one more car to round out our judging class, which is something we should really be aiming for! With three of us, we're all guaranteed trophies. With only two, well... we're guaranteed to be judged against whatever random weirdness happens to show up that day. Not ideal!